Some of the top-of-the-line laser levels have ranges up to 3,000 feet! So you bet using a laser level outdoors is workable! A more common distance is 1,000. This allows them to be used outdoors for construction projects in the yard or in commercial zones. Some outdoor projects can include building fences, laying out a construction site, building decks or fencing, and establishing grades. Naturally, using a laser level outdoors is distinct from using it indoors. Often, indoor use is at very short range, to create level stripes on walls, aligning cabinets, etc. Things get a bit different when going outdoors. A lot of that comes from the fact that daylight can play havoc with a beam’s visibility. So, here’s a friendly guide to using a laser level outdoors. Use on level ground. Obviously, if your level isn’t, itself, level, neither will be the line it creates. If at all possible, go with whatever flat surface you can find. However, using a tripod can help. If the ground is close to level, with only a few tiny discrepancies here and there. If should be easy to get a tripod level. Many levels have self-leveling functions. Make sure to activate this first if so. Self-leveling is done by an internal pendulum. It can mean that you get the laser very close to level and it goes the rest of the way. It can mean leveling itself after being jarred, which is very handy. Now, just in case you hear the phrase “auto-leveling,” that’s different. Auto-leveling describes a laser level that actually does the leveling for you completely. It’s driven by internal servo motors. In any event, the laser has to be level before doing anything else. Now that you have the device ready to go, size up the exact point at which you want to aim the laser. Aim it, and lock the laser at that point. Take the laser receiver to the place where the beam should go. You can either put the receiver in place with the magnet that comes with it or put it on a flat surface where it will be directly even with (the same height) the level. Move the receiver so that it catches the beam from your trusty level. The receiver’s small LED light will light up. Steady the receiver or lock it into place with a tripod. Using the level in tandem with the receiver determine your desired measurement, grade, or alignment. 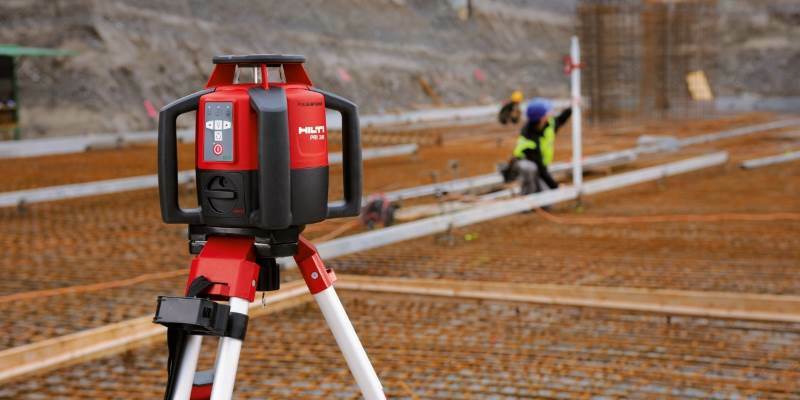 We’ve shown you some basics, but whenever you’re using a laser level outdoors, you’re using it for something! So let’s take a look at some common uses for the level in the great outdoors. Do keep in mind that we’ll have other specific guides for various tasks, both indoor and outdoor. This is for contractors or land-owners wishing to do their own construction. Leveling ground is extremely important for such crucial jobs as putting in a lawn, putting in sidewalks, and laying the foundation for your home! A perfectly level ground means a stronger foundation, meaning water doesn’t get through. Set up the tripod. Most levelers come in a leveling kit and this will include a tripod. It’s probably a sure bet you’ll be going with the tripod because these leveling tasks when using a laser level outdoors are for too crucial not to. Make sure the tripod’s pin is firmly in the ground, then attach the laser level. Activate the laser level’s self-leveling function or manually do it. Determine the point at which you want the surface to be. Place the grade rod there. Ideally, you’ll have a buddy with you who can help. Shoot the laser beam at the point that is marked thusly. Have your assistant align the laser detector to meet the laser beam. Now it’s time to nail things down by tweaking the laser detector. Carefully transport the laser detector to the place where you want to locate the level. Point the detector at the level and move it up and down until you hear a steady beep. If you hear intermittent beeping noises, you’re off level. So, that’s the process, and then the idea is to repeat these steps at various points to create your level surface all across. Leveling land for a drainage project is almost a backwards type of leveling, but one that requires as much precision. Basically, it’s all about grading the land gradually downward or digging the actually drainage system sloping downward. Begin with a tripod, setting it level and placing the level atop it. Create the benchmark of the height at which you are. Choose the path of the trench, focusing on the end of it. Turn on the laser level. Go through the [basic steps of creating a measurement] to create opposing marks. Do mathematical calculations to compare your measurements with the reading on the device. This lets you know whether you are in need of removing dirt or filling it in. Well, we’ve now given the specifications for outdoor use of laser levels; we’ve looked at some specific uses; now let’s talk about some issues that you may confront along the way. 1. Eyeballs- Using a laser level indoors (vs. using a laser level outdoors) is one thing—you may be alone or with one partner, and in some cases, you may be at very short range, as in working with cabinetry. Outside, you are gazing along a long laser line. Further, you could be in a situation in which it’s possible for your beam to inadvertently cross the path of drivers or passersby. You could have co-workers or friends standing near you. While it’s important for the operator of a laser level to wear safety glasses indoors, it’s important for everyone around to wear them outdoors. 2. Visibility- If you’re using a laser level during daylight, it’s going to be much harder to see than when you’re in a basement. One remedy for this is green or red tinted glasses that sometimes come with a laser level kit and that sometimes can be sold separately. There’s also such a thing as a laser finder that you can get. 3. Batteries— Often, indoor use involves switching the laser on and off a lot, needing its line only intermittently. Outdoor, you’re going to be moving around a lot, leaving the beam or at least the unit on for extended periods. Be sure, then, to have extra batteries with you. Using a laser level outdoors isn’t necessary much harder than using one indoors. However, because of the distances you’ll be walking when doing so, it may be a two-person project. Just be sure before you begin, that you have a tripod, leveling rod, and tinted glasses, plus a dust mask. If you’re just getting started with using a laser level outdoors period, you should read these guidelines repeatedly, along with the manual from the machine, and be careful and cautious as you go. You can also check our best laser levels review for 2018, if you do that, you’ll have a great and successful project! BestLaserLevel.net is a participant in the Amazon Services LLC Associates Program, an affiliate advertising program designed to provide a means for sites to earn advertising fees by advertising and linking to amazon.com. Best Laser Level Copyright © 2019.